In July 1972 my companion and I suddenly found ourselves with time for a vacation. Since our passports had expired, our choice of destinations outside the United States was limited. The Caribbean was among the possibilities. She wanted to relax at a beach resort; I wanted to visit a place that held some historical interest. We compromised on Guadeloupe and Haïti. Prior to arriving in Port-au-Prince I read up on Haïti. Though my familiarity with painting was then limited to an undergraduate 'art appreciation' course and visits to museums in Europe, I was intrigued by accounts — in guidebooks — of the country's 'self-taught' artists. Even before landing at François Duvalier International Airport, I had resolved to buy something if I found a work I liked. I liked a lot. In the three galleries I visited, I liked eleven paintings well enough to buy and to haul back to New York City, our home at the time. Packed in jerry-built cardboard cases, the works accompanied us as excess baggage and arrived without incident. On subsequent visits I returned with well over 100 paintings — similarly packed and carried as baggage — to New York and to airports near my homes in Albany, New York, Washington, D C, Miami, and San Francisco; only one was damaged in any way. its artists were relatively inexpensive was also a consideration, and not a small one. Among the eleven I bought on my first trip, five remain among my favorites — works by Montas Antoine, Kesnel Franklin, Jacques-Enguerrand Gourgue, Louines Mentor, and Petion Savain. 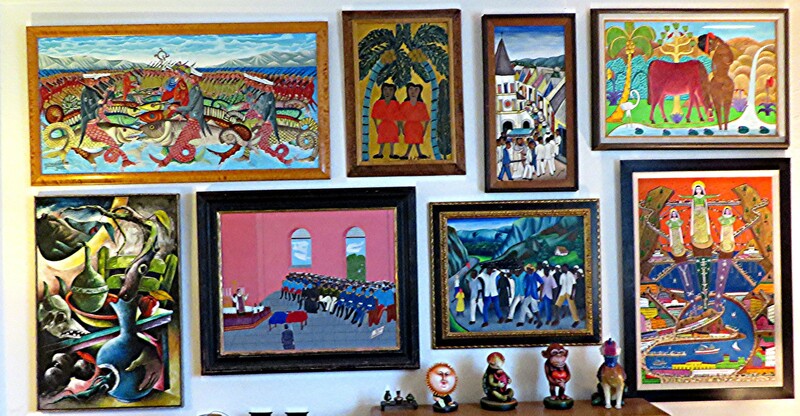 Though I visited Haïti two dozen more times after 1972, and bought paintings on each trip, I doubt the average quality of those purchases was greater than that of my initial buys — except when I picked up works I had commissioned from such masters as Rigaud Benoit, Philomé Obin, and Gourgue himself. That first visit was memorable for two other reasons: an evening and dinner spent with the fine artist Nehemy Jean and an enduring friendship formed with a chauffeur-guide who, like so many of his countrymen, is now in the U S.
I have not, alas, been back to Haïti since 1990. Because I'd been accosted in a couple of incidents that could have ended very badly — and because the violence that has plagued the country since the overthrow of Jean-Claude ('Baby Doc') Duvalier in 1986 has often ended very badly indeed — I've stayed away from a country I had come to love. ‰ Each work on the artist pages is linked to an enlargement which may be seen by clicking on the painting. ‰ A florette (_) next to the title of a painting indicates that a photograph of the artist appears alongside the enlargement of that work. ‰ A star (H) next to an artist's name indicates that I commissioned one or more works from him. Those pieces are identified in my narrative. at inches to pixels (e.g., 24 inches = 240 pixels) though the correlation is only approximate. ‰ A title in 'quote marks' was supplied by the artist or a gallery owner, or is painted on the front or written on the back of the work. ‰ Some of the photographs of paintings are bad. As time permits I will replace them. ‰ Some of the the photographs of artists come from the websites of galleries, notably Macondo and Medalia. My thanks to all. ‰ Vodou is also spelled vodon and — less justifiably — voodoo, voudon, etc. Most terms associated with the practice, or belief, have both Kréyol (Creole) and Frenchified forms: e.g., lwa/loa, ounfò/humfor, oungan/houngan. I use mostly the Kréyol versions.